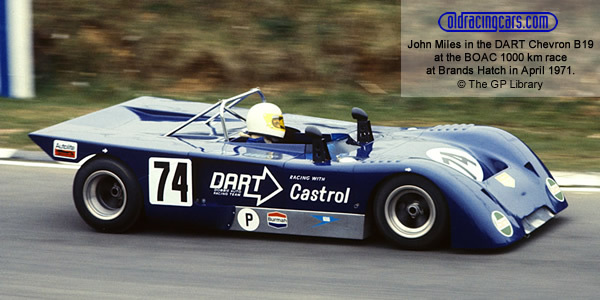 After Chevron had snatched the 1970 title from Lola, Lola exacted their revenge in 1971 when the Lola T212 narrowly beat the Chevron B19. The top teams were Karl von Wendt Racing, who won three races with Helmut Marko at the wheel; Scuderia Filipinetti, for whom Vic Elford and team manager Jo Bonnier each took one win; and Red Rose Racing, whose Chevrons took Niki Lauda and John Hine to victory. The other race winners were Toine Hezemans in the DART Racing Chevron B19 and Abarth Corse whose Abarth 2000 SP won at Vallelunga in the capable hands of Arturo Merzario. The driver's championship was won by Marko, with three wins and a second place, from Elford (one win, two seconds). Had there been a championship of engines, it would have been won very comfortably by Cosworth's 1790cc FVC. Autosport did not provide a full points table but did for the constructors title. The drivers' table above has been calculated from results and matches' Autosport's comment that Marko gained 36 points to Elford's 24. Note that Marko and Jabouille shared the winning car at Paul Ricard in April. Autosport's season review was published 2 Dec 1971 pp38-40.